There are many stereotypes associated with being an architect – our “over-the-shoulder” messenger bag is certainly one of them. In my particular case, I definitely fit the mold of the architects stereotype because not only do I have a messenger bag, I love the one I own. 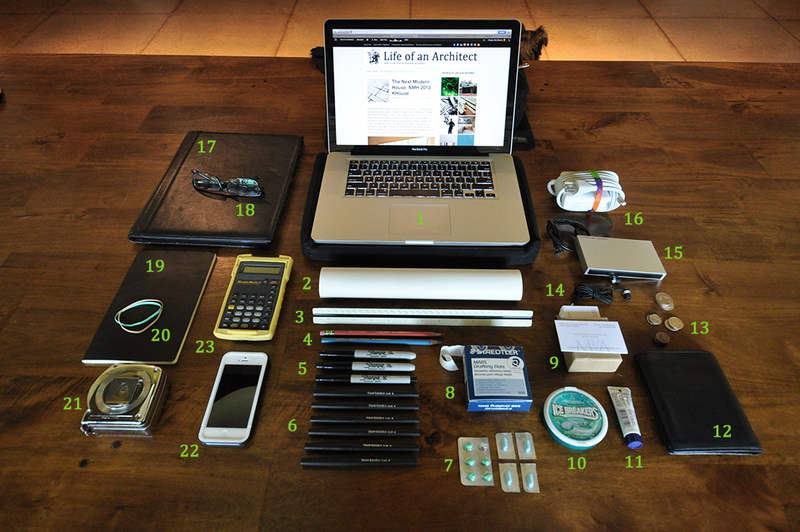 I wrote a post a while back titled “An Architects tool bag” where I listed the things I thought were paramount to me doing my job. In that post, I talked about the items that were in my office that I used the most often – that is not what this post is covering – I thought it would be interesting to show people what I carry around in my bag. I’ve seen posts like this before and while being a little bit voyeuristic, I typically find them interesting (I’m not going to think about what that says about me). MacBook Pro 15″ – I got this computer for my birthday present in 2012 after being a lifelong PC user. Despite the fact that there are aspects of my Mac that I love, I am still struggling to learn how to use in some instances. 12″ x 50 yard roll of trace paper – I go through a lot of trace paper and I can’t imagine that ever changing – I do wish that I still had access to yellow trace, but the yellow doesn’t xerox as cleanly as the white. Architectural scale – I literally have dozens of these things laying about – they are like zucchini in the summer time, they seem to multiply on their own over night. Sharpie Pens – ‘Fine Tip’ and ‘Ultra Fine Tip’ – Two of my heavy use go-to pens for sketching. I like to sketch with the ultra fine tip but I almost always go back over them with the fine tip to add some pen weight and profile lines. I don’t really know why it’s called a “fine tip”, it’s not particularly fine. Paper Mate Pens – Flair M – the first pen that has worked its way into my “all Sharpie pen” lineup. I’m not sure or when I started using the PaperMate Flair pen but it has replaced the Sharpie Ultra Fine Tip pen as my daily use pen. All you have to do is look at the quantities and you know this to be true. Medicine – Gas X (for bloating) and Sominex (sleep aid) – including these items on this list takes a bit of courage. I’ll admit that flying tends to make me bloated and I don’t want to be “that” guy poisoning the air on the plane. You’re welcome. Staedtler Mars – Drafting Dots – I used regular masking tape when I was in school but now that I’ve “made it”, I pony up for the drafting dots. Business Cards – I hand out a lot of business cards and so I generally keep a lot on hand. Ironically, I don’t hand out these cards to potential clients all that much, most of the time it’s at consultant and vendor meetings. Ice Breakers Breath Mints – again … you’re welcome. Aquaphor Lip Therapy – I hardly use this stuff but I keep it in my bag anyways. It’s pretty humid where I live and if I travel somewhere dry, I need this stuff. Headphones – Sennheiser IE4 ear buds – great headphones pure and simple. Portable Hard Drive – LaCie Porsche Design P’9220 1 TB USB 3.0 Portable External Hard Drive 302000 – I don’t like to keep to keep ‘Life of an Architect’ stuff on work computers (and I process a lot of photos and graphics) and so I carry around this portable hard drive. MacBook Pro 85w Magsafe portable power adapter with wrist bracelet rubber band – I have two chargers, one I keep at home and the other that travels with me. Despite the fantastic packaging that is associated with Apple products, I’m not aware of one that deals with the power cord. I took a rubber wrist band bracelet that my daughter had (and said she wasn’t EVER going to wear) and use it to keep my cord nice and tidy. Tumi Men’s Meridian Letter Padfolio – also a gift from my wife some years ago, this is what I bring with me to client meetings. There is room inside for a pad of paper, a pen, some business cards, and storage or loose papers. Black framed glasses – what did you expect? Moleskine Classic Soft Cover Large Plain Notebook – Black (5 x 8.25) – have literally have dozens of these things, and yes, I like to sketch in them. Rubber bands – size #32 – I buy my own rubber bands and I always look for the #32’s. Not only are they sturdy enough to wrap up a roll of drawings, they are superb for shooting at your coworkers. Stanley Powerlock Tape Measure – 30′ length – Surprised at how often I need this but I generally keep it in my car, it’s too heavy to tote around every day. Not sure why it was in my bag today. iPhone 5 – my sweet, new phone … that I love. Calculator – Calculated Industries ‘Measure Master 5’ – Calculated Industries actually has the latest version of their calculator available as an app, and I have it on my phone … I just need to remember that it’s there and I’ll probably leave the calculator at the office. There you have it – a sneak peek into my bag. If you want any of these items for your self – or maybe you just want to see what they might cost – the links above will take you to the right place. I think it would be sort of fun to see what other people – designers, students, contractors – anyone who carries a bag – has in their bag. If you feel so inclined as to share, just send your pictures in to me and I’ll post it here on the site. All you need to do is copy the format I have above (don’t worry about adding the numbers to your image, I’ll take care of that for you. Take a picture of your bag closed, and then one with all the contents spread out on some surface, with a description of the contents. If your pictures are in focus, chance are extremely good that they’ll show up here on site. I think this could make for an extremely interesting photo essay.